What is all this talk about hooping? Don’t you mean “hula hooping”? Well, technically, Wham-O owns the rights to those words, so today it’s just called “hooping”. And these aren’t your typical kid-sized hoops. They are custom made, adult-sized hoops that fly around your body with ease. Hooping is also referred to as “hoopdance”…as the goal is really to dance within your hoop and get your groove on! Hooping is fun for everyone! It will raise your heart rate. Hooping can burn 400-600 calories per hour! And you don’t even realize it because…yep, it’s fun. I will also strengthen your core, your arms, legs…you name it. It’s a great workout. Both Bella and Matt have their own hoops and we love to hoop it up as a family. Bella learns new tricks so fast…it’s fun to watch her because she is so intuitive about the flow. She just does it…without fear. I learn from her every day. 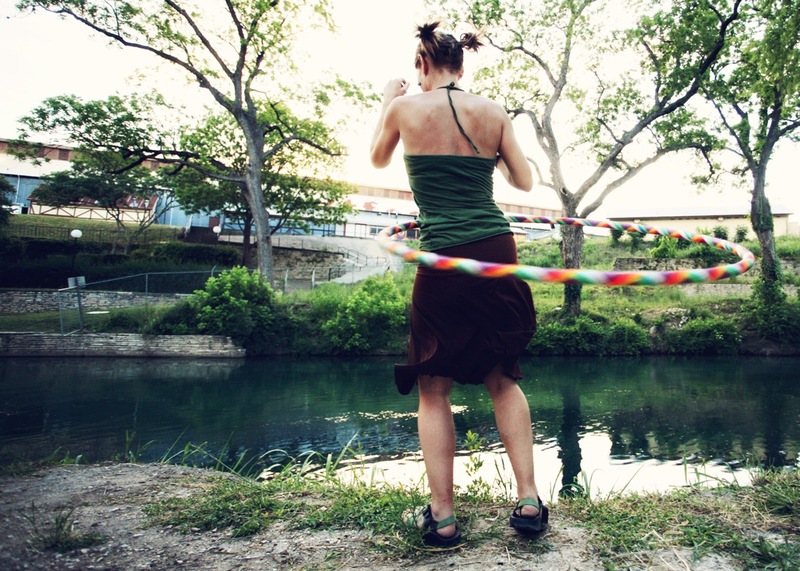 Similar to yoga, spinning a hoop can calm your frenzied mind. Your hooping experience can be whatever you want it to be…depending on how fast or slow you’re hooping and what music you might be listening to. Once one person starts learning and having fun with a hoop, everyone wants in on the action. It’s a fun way to pass time and chill with friends and family, there isn’t a huge learning curve, and you can do it anywhere! Bring a handful of hoops to the park and pretty soon, you have a party!